To start the year off nicely, Dave recently picked up two awards for his coaching efforts. 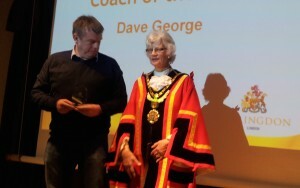 The first was “Sports Coach of The Year” for Hillingdon Borough, presented at the Borough’s annual sporting awards. 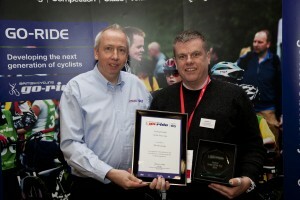 The award was in recognition of the work Dave carries out in his role as Head Coach at Hillingdon Slipstreamers. “Dave is a level 3 coach and has gone from strength to strength. He had a difficult task, following the passing of our much loved founder and President, Brian Wright in 2012. However he has taken on the role of head coach fantastically and has won the respect of youth riders, volunteers and coaches alike. In a short period of time he has become Slipstreamer’s guru in all things cycling coach related and has taken the club to greater heights. 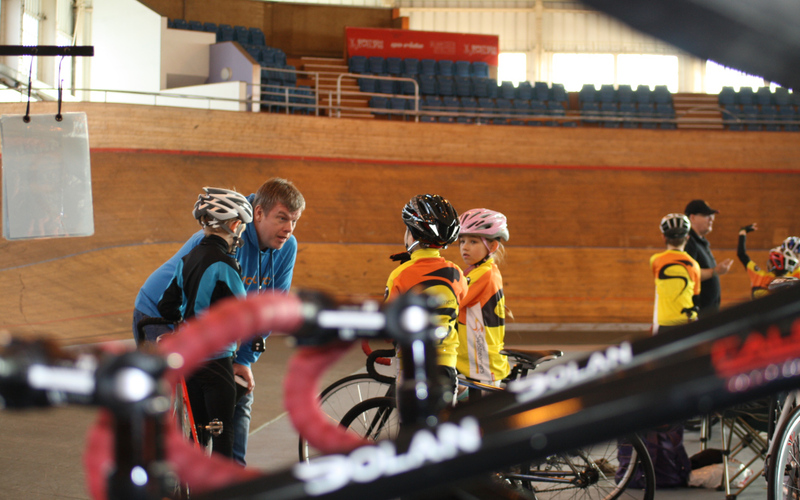 He liases with all the regional and national coaches at British Cycling, attends numerous meetings, keeps up with all the latest material from our governing body and steers the children towards their individual goals at whatever level they are striving for. His enthusiasm is endless and always has time for every member of the club. He is the first one to arrive at “ The Mothership” as he refers to the clubhouse and circuit, every Saturday. He co-ordinates the early bird session at 8am and then continues into the main session at 9am through to 12.30pm. He has organised all of the club championships and their constituent parts, has judged numerous races throughout the year, often midweek after work and has acted as chief judge at our round of the National event we hosted this year. The latter (sorry Mum!) was my choice. The Go-Ride conference is a chance to meet with British Cycling and other Go-Ride clubs and officials in very relaxed environment. We get the chance to learn of future BC plans, have a forum in which we can feedback successes and failures, and for coaches a chance to extend our own knowledge through CPD (Continuous Personal Development) workshops. The conference always starts with the numbers, and this year was no exception. See the infographic for a feel of how Go-Ride clubs contribute to the overall success of the organisation. The big number of cycling opportunities for young riders at ½ a million is stunning. Within Slipstreamers, we generate over 6000 opportunities alone by providing cycling for over 100 young people every week, 52 weeks of the year with just our Saturday sessions. Add in the racing events we put on throughout the year, and our tally goes even higher. The national average of opportunities provided by all clubs is almost 1400 – so we as a club contribute to a large piece of that statistic! The conference always ends with volunteer awards for people who have been recognised for contributing to the success of British Cycling Go-Ride clubs. For myself, it was a real honour to represent Slipstreamers by collecting the 2014 Coach of the Year Award for Central, and to stand alongside both Alison and Hannah as they collected theirs.